SCOPE is a year-long unique industry-university collaboration between interdisciplinary student teams of seniors advised by a faculty member provide innovative solutions to a company's real-world problems. As students, our job is to solve a challenging, non-mission-critical problem that has significance to our sponsor. 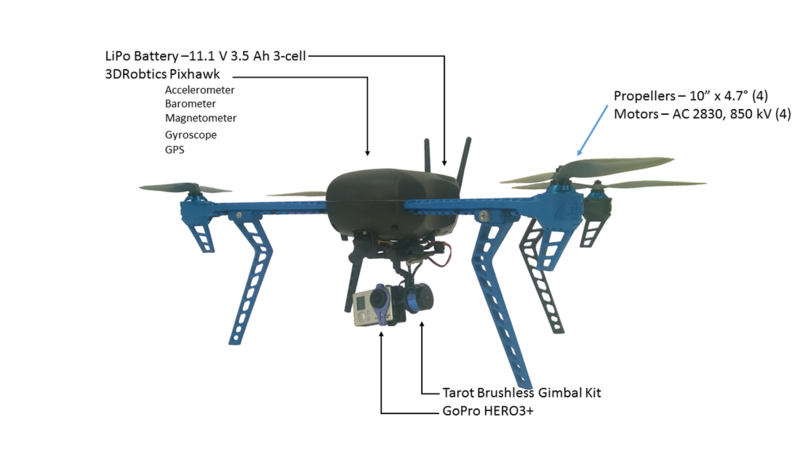 This year's team developed high-level autonomy software that integrated multiple autonomous air and ground vehicles to monitor and treat fields of crops. 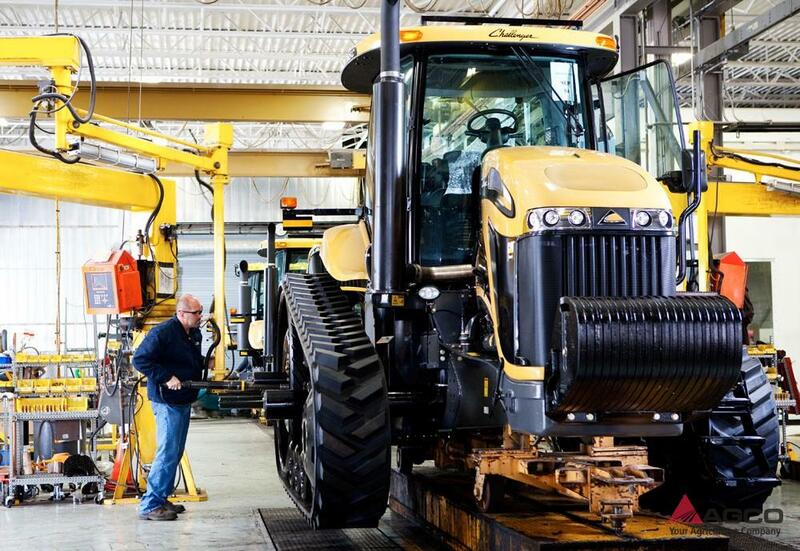 The average farm size for AGCO's customers is too large to inspect thoroughly (approx. 1500 acres, or about 2.3 sq. miles). Therefore most inspection is done by driving around a field and manually inspecting plants. Problems are often caught late or not at all, resulting in crop loss. The overuse of chemicals in blanket spraying is costly and not beneficial to the environment. Thanks to advances in technology and the increased demand of smartphones, accurate GPS systems, inertial units, and faster processors are becoming more affordable. Satellite imagery has also become commonplace and it is possible to get fairly accurate images in both hyperspectral and infrared wavelengths. Advances in technology have now made it possible to identify areas of distressed crops. Being able to target those specific areas would help farmers not lose their crops and avoid spraying unnecessary chemicals on crops. Create a system that can coordinate a fleet of vehicles to effectively detect and treat problematic areas. We used an unmanned air vehicle (UAV) and an unmanned ground vehicle (UGV) to find and locate a problem in a test area on a field. Communicates to rest of system through our ROS Bridge link. 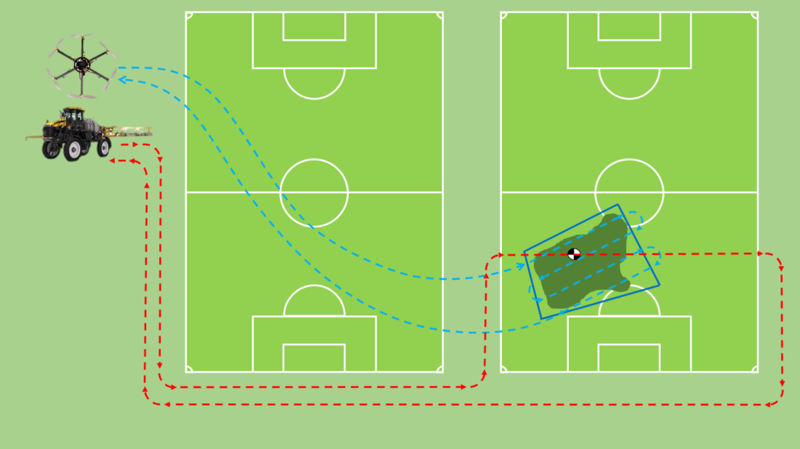 Our software is able to successfully command multiple UGVs and UAVs to execute a computer-generated mission. 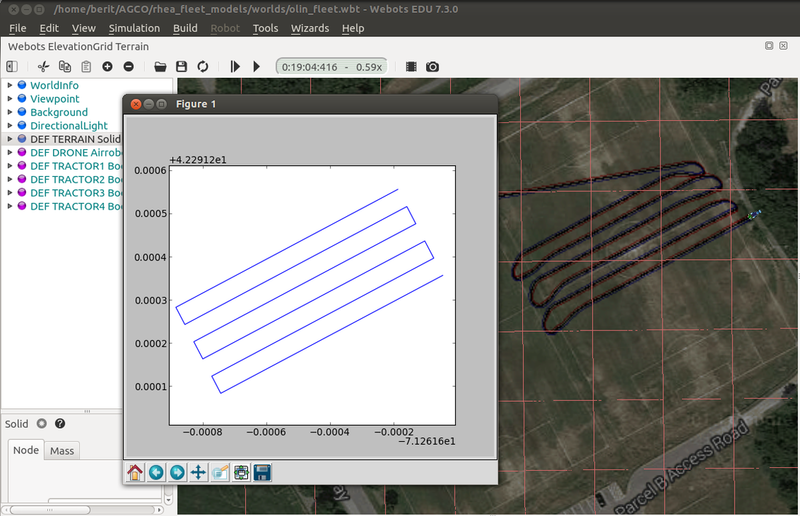 The three software components include a Python backend, LabVIEW frontend, and UAV control software. The user interface allows an operator to override the auto-generated path from the Python software. 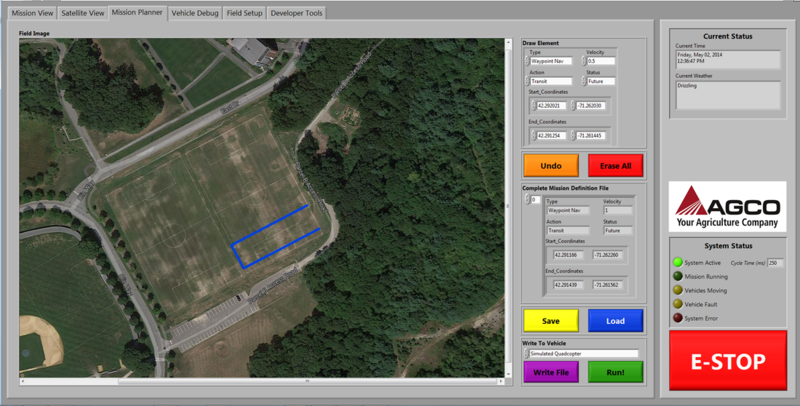 The open-source UAV control software communicates between the base station and the UAV to provide UAV status updates via a graphical user interface (GUI). Design, fabrication, and assembly of mechanical components onto tractor in order to make it into an autonomous vehicle. Also responsible for electrical system and software architecture and implementation based off of the Olin Robot Software Architecture (aka. Olin's Robot Brain). 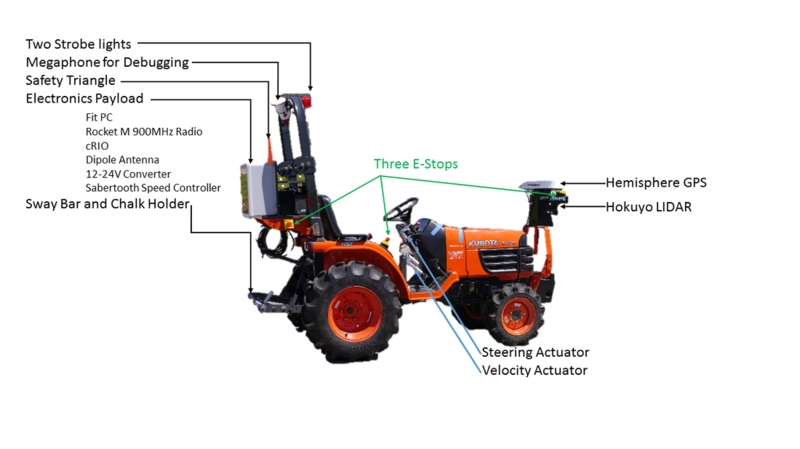 Responsible for "hindbrain" tractor software development, or actuator control software. Communications Lead: Responsible for the development, collection, and maintenance of all information about the project. Responsible for explaining the project, relevance, and value to various audiences (eg. project sponsors, peers, and the general public). Responsible for identifying and archiving materials for use in presentations and press releases, as well as providing public relations material (as well as obtaining permission to use such materials from the project sponsor).